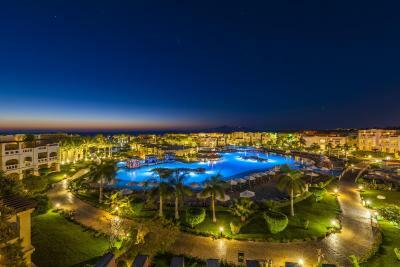 Lock in a great price for Rixos Sharm El Sheikh - Ultra All Inclusive – rated 9.1 by recent guests! 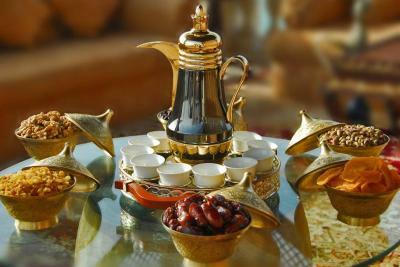 Everything was at least pleasant if not perfect but food was moderate. As a former hotel, aviation and travel agency employee and with 20 years of experience, I have seen many good hotels but Rixos Sharm is the best hotel I have seen so far. My honest suggestion to everyone who is reading my comment, even it is a little more expensive than some resorts in Egypt, you will still pay far less than winter holliday destinations around the world and this hotel deserves every penny you pay. 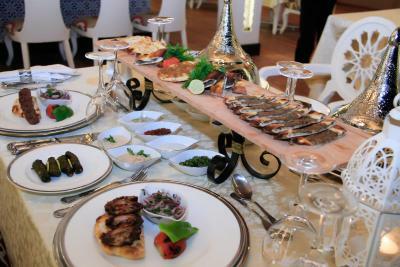 From seafood to jucy beefs or wonderful salats and cold dishes the food was excelent. I will happily visit this resort in the March or April because 30 C is my favorite temperature. Excellent facilities and staff. People working at the hotel were really professional, friendly and helpful! The staff were friendly and helpful. The 7 a la carte restaurants were amazing (especially the Indian, Chinese, and Italian). The daily concerts were fascinating. Its really All-Inclusive. Rixos Sharm El Sheikh - Ultra All Inclusive This rating is a reflection of how the property compares to the industry standard when it comes to price, facilities and services available. It's based on a self-evaluation by the property. Use this rating to help choose your stay! Rixos Sharm El Sheikh Resort is located on seafront among palm trees. 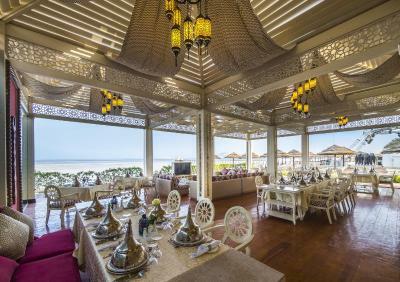 It features free WiFi in all areas, a sandy beach, 11 swimming pools, 7 à-la-carte restaurants and 5 bars. Private butler services are offered at the private beach and pool cabanas at an added fee. 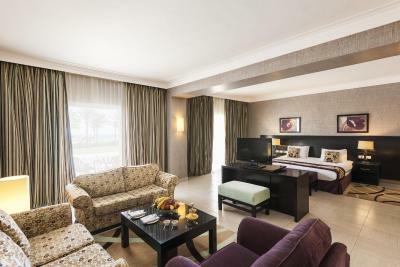 All rooms at Rixos come with a balcony or terrace overlooking the sea, garden or pool. Each room comes with a flat-screen TV, a mini-bar, a wardrobe and a telephone. Some rooms include a spacious seating area. 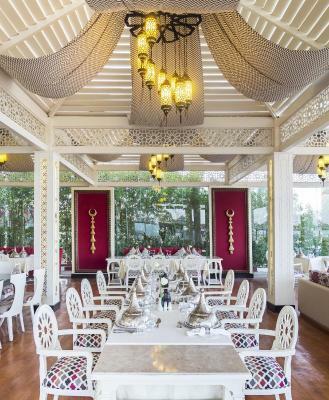 Guests can enjoy an authentic Turkish, Japanese and seafood dining experience at Lalezar, Sakura and Hatmehit. 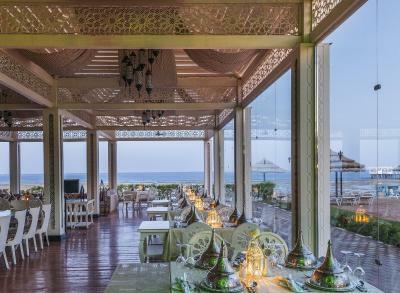 Callaina restaurant serves Italian cuisine from à-la-carte menu, while Papyrus offers Oriental dishes. There is also an Indian and Chinese restaurant. The resort offers evening entertainment options that include a night club, discotheque and open air beach night club. 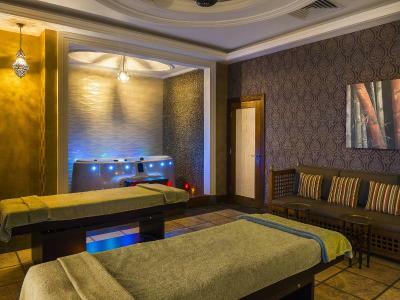 Rixos’ spa offers a range of relaxation options, including full-body massages and facials. 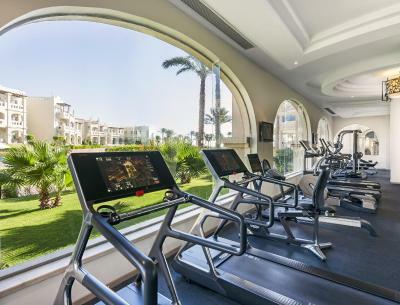 There is also a modern gym equipped with state-of-the-art cardiovascular equipment. The property also includes 3 water slides. A range of sport activities are available on site such as tennis, table tennis and beach volley ball. Other activities include darts, billiards and snorkeling. Children can enjoy their time at Rixy Kids. Naama Bay, with its promenade, is 14 mi away from Rixos Sharm El Sheikh. Sharm El Sheikh International Airport is 5 mi drive away. A complimentary shuttle bus is available to Naama Bay promenade. When would you like to stay at Rixos Sharm El Sheikh - Ultra All Inclusive? Featuring a balcony or terrace with side views of the grounds or pool, this modern, air-conditioned room includes a flat-screen TV, a minibar and an electric kettle.The bathroom is fitted with free toiletries and a hairdryer. Please note that soft drinks and beer are refilled daily for free. This elegantly decorated room offers a balcony or terrace with a pool or garden view. It offers a spacious seating area with a flat-screen TV, a mini-bar and a safety deposit box. The bathroom includes a bath and a separate shower cubicle. Please note that soft drinks and beer are refilled daily for free. Featuring a balcony or terrace with a pool or view of the grounds, this spacious, air-conditioned room features a modern décor. Facilities include a flat-screen TV, a minibar and an electric kettle. The bathroom includes a bathtub, a hairdryer and a separate shower cubicle. Please note that soft drinks and beer are refilled daily for free. Featuring a balcony or patio with a pool or view of the grounds, this spacious, air-conditioned room features a modern décor. It includes a flat-screen TV, a minibar and an electric kettle. The bathroom has a bathtub, a hairdryer and a separate shower cubicle. Please note that soft drinks and beer are refilled daily for free. This suite has a balcony with a pool, garden or side sea view. It includes a living area with a flat-screen TV, a walk-in closet and a minibar. The bathroom is furnished with a hairdryer and a bathrobe. This suite has a balcony with a pool, garden or side sea view. It includes a living area with a flat-screen TV, a walk-in wardrobe and a mini-bar. The bathroom is fitted with a hairdryer and a bathrobe. 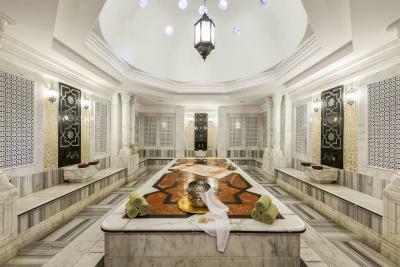 - 10 % discount at Rixos Royal Spa for all treatments. - Free shuttle service to Naama bay (city Centrum) two times during the day . This suite has a balcony with a pool, garden or side sea view. It includes a living area with a flat-screen TV, a walk-in closet and a minibar. The bathroom is furnished with a hairdryer and a bathrobe. Please note that soft drinks and beer are refilled daily for free. This triple room has a balcony, tile/marble floor and air conditioning. Please note that soft drinks and beer are refilled daily for free. This elegantly furnished Royal Suite consists of a spacious living area, luxury dining area and separate bedroom equipped with comfortable amenities. It includes a large terrace area leading to 2 private plunge pools with sea view and views of Tiran Island. A mini bar, a flat-screen TV and 2 walk in closets are also available. The bathrooms are fitted with his and her sinks, a hairdryer, bath tub and a walk-in shower. This junior suite features a spacious living area, a large terrace area leading to a private plunge pool and a sea view, a mini bar, a flat-screen TV and a walk in closet. The private bathroom includes a his and hers sink as well as a tub with a separate shower cubicle. Offering a balcony or terrace with side views of the garden or pool, this modern, air-conditioned room features a flat-screen TV, a mini-bar and an electric kettle.The bathroom is fitted with free toiletries and a hairdryer. Please note that soft drinks and beer are refilled daily for free. House Rules Rixos Sharm El Sheikh - Ultra All Inclusive takes special requests – add in the next step! Rixos Sharm El Sheikh - Ultra All Inclusive accepts these cards and reserves the right to temporarily hold an amount prior to arrival. Please note that this hotel accommodates families and couples only. Children from 03 till 06.99 years are not allowed to enter concert area .However they will enjoy their special program at Rixy kids club. Food was moderate to OK but for sure not a five star dining experience. Nothing to afraid of anything, there are lots of touristic places and the people are very kind and helpful, hotel is close to the airport, excellent and very kind and friendly staff, lots of restaurant, clean rooms, shuttle from and to the airport service is perfect, pyramids diving is in the hotel so thanks to them we did have a great experience. Shuttles in the hotel are perfectly help us and very funny. Excellent choice for a 5 star resort. Totally a great vacation with staff extra friendly and going extra mile to make you comfortable. Buildings are starting to show their age. More restaurants are needed. I booked for the party for me and my family on new year's eve They said that they are saving the best view for Arab guests and that the the party was only for hotel guests which was a big hoax As usual there is a " VIP" place for " important people" who are not from the hotel customers of course; this was directly on the stage and other people were not let to go near there of course. This resulted that we were placed on the side and when can barely see the stage, and the guards even stopped us from going down to the place that supposed to be the dance floor but after some shouting it was ok.